It looks like Canon will get it BIG,this time, let's hope so. As soon as I got more news will let you guys know but for now here is today's official announcement. 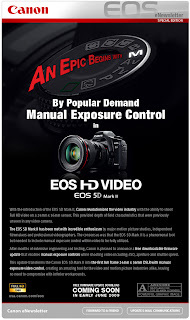 Canon has announced a firmware update for its EOS 5D Mark II digital SLR enabling manual exposure when shooting videos. With the updated version, users will be able to manually adjust the shutter speed, aperture and ISO settings in the video mode. The new firmware will be available for download on 2 June 2009 from Canon's website. The EOS 5D Mark II integrates full HD movie capability into a high-end 21.1 Megapixel camera; opening a multitude of new possibilities for photojournalists and news photographers. Since its launch the camera has proved its appeal to professionals working in diverse fields, from studio and wedding to nature and travel. Now, following customer feedback, Canon has improved functionality for professional video users, further unleashing the potential of the EOS 5D Mark II for cinematographers and photographers alike. The 5D Mk II allows for still capture while recording video. This is great news though -- the video recording function is so good, and yet...not good enough.